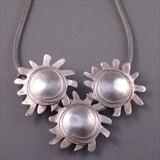 I am a jeweller, designer and enameller. I work in Sterling silver, gold and copper. 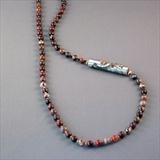 I incorporate semi precious beads in to the design. 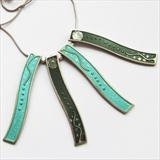 I make and design all my pieces myself and I specicalise in enamelling. 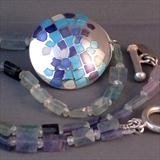 I enjoy the play of colour and light that emamel gives to the piece of jewellery. I also experiment with different surface effects and use such things as piercing, reticulation and etching. I am a full member of the British Society of Enamellers and also a full member of the Society of Botanical artists. I work with enamel and precious metals. 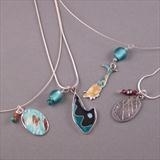 I use transparent enamels and love the clear jewel like qualities that they give to the jewellery. 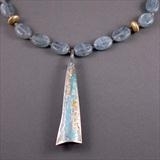 I incorporate different combinations of wires, foils and engraving on the piece to create movement and depth. Using colour and surface effects in my work has always inspired me. I am particularly interested in geological forms and erosion and decay. The designs that I use favour a contemporary look, especially for the more affordable pieces. I get inspiration from many sources fashion, interior design and contemporary artists. 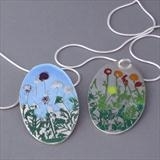 I treat my jewellery pieces as mini canvases and hope to inspire people that enamel work is not boring or old fashioned. Most of my work is ‘one off’s’, and I relish commissions, the personal aspect of designing a piece for a particular person is very satisfying. January 2007 Award for Encouragement the 20th International Cloisonne Contest, Japan. Christmas Exhibition, POSK Art Gallery, London 2011. Bedford Park Summer Exhibition, June 2011.